Linden Lab have announced the second live comedy event to be held in Sansar. The SF Sketchfest will take place between 13:00-14:00 PST (21:00-22:00 GMT) on January 12th at the new SF Sketchfest Playhouse. 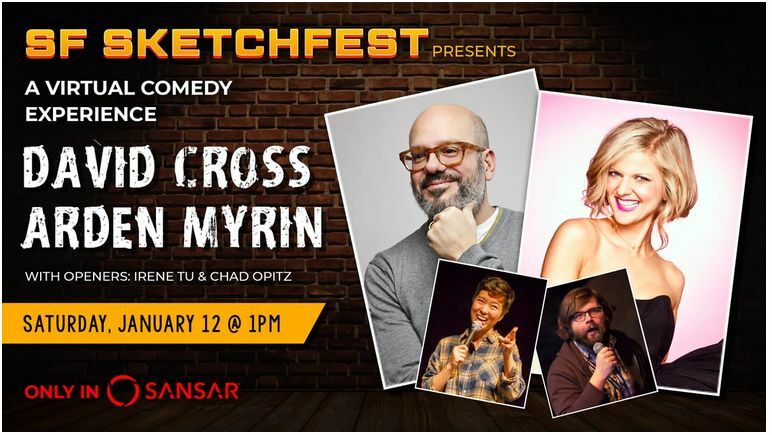 The event will feature comedians David Cross (Mr. Show and Arrested Development fame) and Amy Schumer (MADTv, Insatiable, Shameless), together with openers Irene Tu and Chad Opitz). 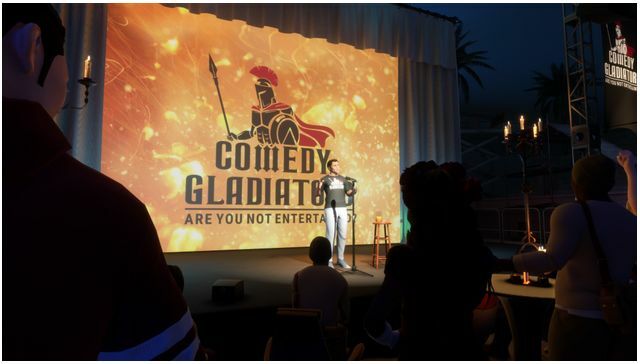 Compared to the Comedy Gladiators event hosted in Sansar on December 10th, 2018 (read more here), the SF Sketchfest is receiving fairly low-key and what seems to be very short-notice advertising through social media (by contrast, Comedy Gladiators was promoted via a press notice via the Lab). Ticket for the event are USD $4.99 each, and can be purchased directly from the Sansar Store. These events utilise Sansar’s Broadcast capability, allows avatar audiences across two or more instances of an experience to experience performing avatars, with instances allowing a greater opportunity for friends to attend the vent together (although more work is required to make this more fully possible). SF Sketchfest is also the second official Sansar event to use the platform’s new ticketing capability, which – when expanded – will be a further means for creator / experience holders to monetise their offerings in Sansar. A live comedy showcase that lets anyone, anywhere step directly into a comedy club for the night. The series will allow fans to do everything in VR that they would do at a real-life comedy club: purchase tickets in advance, shop for custom merchandise and memorabilia, even order drinks. The first event in the series is scheduled for 19:30 Pacific Time (US) on Monday, December 10th, and will feature the talents of Ben Gleib, Maz Jobrani, Alonzo Bodden, and Mary Lynn Rajskub – perhaps best known on television for her role as Chloe O’Brian in the action thriller series 24. Comedy Gladiators represents a number of firsts for Sansar. It is the first ticketed event on the platform. Ticketing is a capability the Lab have been developing for a while for Sansar, with the idea that in time, experience creators will be able to sell tickets to events held within their own experiences. For Comedy Gladiators, tickets are offered for sale through the Sansar Store at US $4.99 through until December 5th, and then US $9.99 thereafter, up to the event itself. I would anticipate that in the future, experience creators will be able to sell their tickets the same way. Another interesting factor with Comedy Gladiators is that it mixes the ability to purchase both virtual and physical through the Sansar Store – in this case, copies of Hofstetter’s latest book, Ginger Kidd – with the virtual goods including t-shirts, beer mugs. Finally, the series is potentially the first large-scale showcasing of Sansar’s “Avatar Broadcasting” feature. This allows performers and presenters working from a single stage / experience in Sansar to reach a potentially unlimited audience through multiple linked instances of the event. Every day, I get emails and DMs from fans who want to see a live show, but they live in parts of the world I’ll probably never tour in. VR allows those fans to not only see a live show, but feel like they’re part of a bigger community. It’s not clear where else the event is being advertised – in checking various websites, including Hofstetter’s own, I didn’t come across any direct adverts. However, the media have picked-up on the event, with reports in the likes of Variety, with the original press release being reproduced in multiple on-line media covering business, VR, and entertainment. By bringing these commercial opportunities into VR, Sansar is taking virtual events to a whole new level – enhancing and expanding on what’s possible in-person. We look at Comedy Gladiators as the first ripple in a larger wave – the first event of many more that bring entertainers into VR. It’s not clear how often this series will take place, or whether this first event is simply experimental. However, it is a daring move to bring something new and different to VR, and to extend the concept of social VR within the realm of entertainment. One potential stumbling block is the comparatively low uptake of VR headsets; given Comedy Gladiators is being promoted as a “social VR event”, without very clear underlining that Sansar can also be enjoyed as a desktop activity, there is a risk people might avoid the opportunity to join the audience even if advertising does reach a wide audience due to the misapprehension that a VR headset is a requirement. With thanks to Wurfi for the heads-up. Drew Struzan is a giant in the fields of art and film. Over his 40-year career, his talent has graced more than 150 movie posters for some of cinema’s most memorable films – including Indiana Jones, Back to the Future, and Star Wars – and extends to book covers, album covers, and other fine art. And on Friday, March 23rd, his art will be available within Sansar as a part of the The Hollywood Art Museum (HWAM) project, established by Greg Aronowitz. HWAM’s mission is to encourage artists in the digital medium to find fresh inspiration in the traditional arts of Hollywood’s past, through the preservation and education of art used in entertainment. Its first major exhibition, featuring reproductions of pieces – models, production drawings, props, merchandise from the Star Wars franchise films – which came ahead of the US opening of the latest film in the series Star Wars: The Last Jedi (read more about the Star Wars exhibition here). The Drew Struzan Gallery and Studio marks HWAM’s second gallery space in Sansar, and presents visitors with a unique opportunity to view the work of one of the greatest illustrators of modern times, and to also get a peek inside his private studio. A school Counsellor asked him about his interest in art and told him he had a choice between fine art or illustration, saying that as a fine artist he could paint what he wanted, but as an illustrator he could paint for money. From college, Struzan started his career not in film, but in music, creating the album covers art for artists like Tony Orlando and Dawn, The Beach Boys, Bee Gees, Roy Orbison, Black Sabbath, Earth, Wind and Fire, Liberace and Alice Cooper. 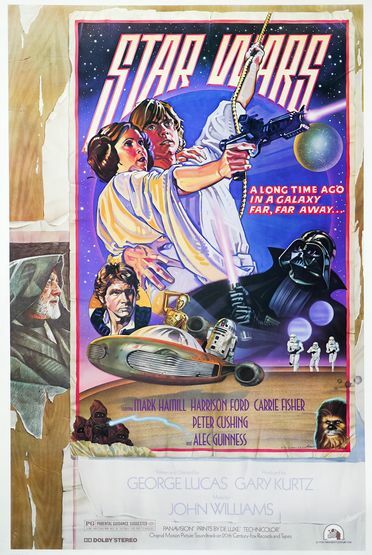 In 1977 he was contacted by fellow artist Charles White III, who had been hired to produce a poster for the upcoming 1978 re-release of the original Star Wars film. 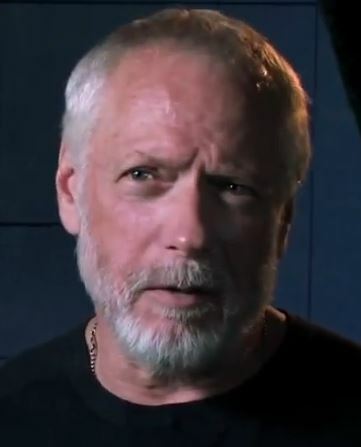 Uncomfortable with portraiture, White asked Struzan for help, and between them they came up with a distinctive poster design, which became known as the “Circus” poster, depicting what appears to be a torn posted bill on a plywood construction site wall. It was the start of an enduring relationship with top-flight movies. For the next 30+ years, Struzan would create some of the most iconic and memorable one-sheets for some of Hollywood’s biggest and highest grossing films and film franchises, including the Indiana Jones franchise, the Star Wars franchise, Blade Runner, the Police Academy series, Back to the Future, E.T. the Extra-Terrestrial, Hellboy, Harry Potter and the Sorcerer’s Stone, and many, many more. For the Sansar exhibition, Greg Aronowitz work closely with Struzan and members of Linden Lab’s Sansar Studios team led by Jason Gholston, to carefully and painstakingly reproduce Struzan’s art – including the “Circus” poster – within an immersive virtual setting. Many of the pieces have interactive elements associated with them: wall-mounted buttons can be pressed to hear audio relating to the pieces. 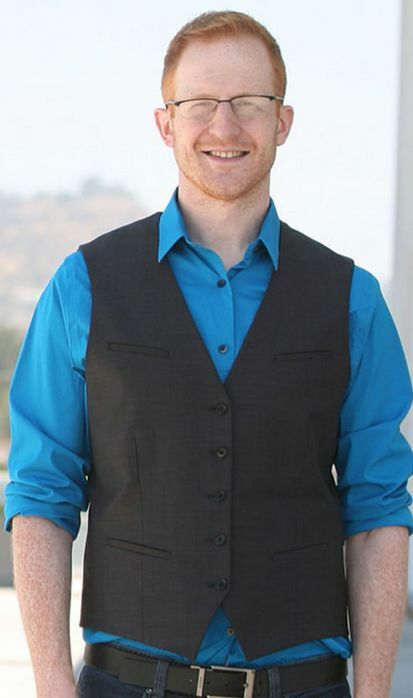 Also involved in the work is Kevin Cain, CEO of Insight Digital. This is the company that, working with the Lab’s Sansar Studios team, brought three real-world sites of antiquity in Egypt into Sansar, allowing people to visit and appreciate them in ways which cannot be shared in the physical world because the sites in question are not open to the public (read more about this project here). For this project, Kevin Cain brought the same techniques used by Insight Digital to map ancient Egyptian tombs and monuments – laser scanning and photogrammetry to accurately reproduce Struzan’s own private studio and then upload it into Sansar as a place for people to visit. The result is a stunning environment – gallery and Studio together – in which Struzan’s art and artistry can be fully appreciated, as a sneak previewed via livestream video by Deviant Art on Thursday, March 22nd revealed. 16:00-17:00: Greg Aronowitz and Drew Struzan reflect on their careers in film and Hollywood, and on Drew’s artistic legacy. 17:00-18:00: an exclusive walk-through of Drew’s never-before-seen private studio, 3D-scanned into Sansar, and find out how the space came together from Insight Digital’s Kevin Cain and Jason Gholston, Head of Sansar Studios. 18:00-20:00 the grand opening party and a chance to tour the entire experience on your own or with friends. To attend the gallery opening, go to the Drew Struzan Gallery & Studio – Grand Opening in the Events section of the Sansar client or on the web 15 minutes before the event is due to start and click the Join option. And for those who want to know a little more about Drew Struzan, here’s the trailer for the 2013 documentary, Drew: The Man Behind The Poster. Here is a summary of events currently planned in Sansar for the week of Monday, March 12th through Sunday, March 18th, 2018, as currently listed in the official events page. The times given here are all PST (the default Sansar time) however, times given in the Atlas are given in your own local time, so times / dates may appear to be at variance to those quoted here. Be aware that voice chat is the preferred – but not exclusive – means of communication at many of these events. Check the events page for events that may be added through the week. Sansar community meet-ups are social gatherings where almost anything is open to discussion and which may be associated activities. Tuesday, March 20th: Meet the Draxies. Wednesday, March 21st: The Diner. Friday, March 23rd: Coffee with Dinosaurs. Product Meetings are twice-weekly opportunities for Sansar users to discuss Sansar’s development with members of the Product Team and specialists working on specific aspects of the platform. Tuesday March 20th, 10:00-11:00: Radio Grind presents…The Experience: Part V. Topic: Access Control & Publishing. Friday, March 23rd, 16:00-17:00: Witchy’s Sandbox. Topic: Virtual Worlds. Hover Derby is Sansar’s first competitive team sport. Training and practice sessions are held 5 days a week, with newcomers welcome. The first official game day is scheduled for April 1st, 2018. Monday through Friday, 09:00: Hover Derby Arena. 15:00-15:30: World Water Day Celebration with SpaceSailor at Water. 16:00-19:00: Drew Struzan Gallery & Studio Grand Opening at the Hollywood Art Museum. 11:00-11:30: Atlas Hopping with Berry and Drax starting at 114 Harvest. 12:00 noon – 13:00: Mimi Carpenter, live in concert at Arena Live Music Stage. Sunday, March 25th, 14:00-15:00: Drew Struzan Gallery & Studio – Pop Trivia Quiz at the Hollywood Art Museum. Monday, March 12th: Avalon Lounge. Tuesday, March 13th: Love Boat Ride. Wednesday, March 14th: Finis Terrae. Thursday, March 15th: The Club. Friday, March 16th: BALLS (m2d). Product Meetings are twice-weekly opportunities for Sansar users to discuss Sansar’s development with members of Sansar’s Product Team and specialists working on specific aspects of the platform. Thursday March 15th, 16:00-17:00: Copper Valley (see my experience review here) – Sansar avatar. Tuesday, March 13th, 11:00: Ready Player One – Torley’s guided tour of Aech’s Garage (see my experience review here). A critique oft levelled at Sansar is there while it looks very nice, there is little to actually do. To a degree, given the state of the platform’s interactive capabilities, this is true; compared to Second Life, Sansar is still very limited in terms of providing people with things to do – but this is gradually changing (see my Product Meeting report for Wednesday, February 28th for more on plans to increase interactive capabilities in Sansar). However, one of the things that Sansar is already enjoying is a strong and growing range of social activities which are open to anyone wishing to participate. So, if you are curious about Sansar, and want to learn more about it, trying the platform’s social calendar can be a good place to start. These are displayed in both the Web and Client versions of the Atlas. To help get you started, here’s a summary of Sansar events for week #10 2018 (Monday, March 5th through Sunday, March 11th, 2018). If popular, I’ll run this as a weekly series. Tuesday: 2077 (see my review here). Thursday: Paranormal Investigation (see my review here). Product Meetings are twice-weekly opportunities for Sansar users to discuss Sansar’s development with members of Sansar’s Product Team and specialists working on specific aspects of the platform. This week the topic for both meetings is: events in Sansar. Tuesday March 6th, 10:00-11:00: 114 Harvest. Thursday March 8th, 16:00-17:00: Studio Club. Thursday, March 8th 19:00-20:00: Geek and Sundry Lounge – watch livestreams from the Geek & Sundry Twitch channel. Today: dungeons and Dragons. 14:00-16:00: Chess TV Lounge – watch John Urschel, ex-NFL star and current MIT mathmetician, makes moves towards becoming a chess master via the Twitch Chess TV channel. 17:00-18:00: Joy of Painting – on the Bob Ross Twitch channel. Wednesday, March 7th, 17:00-18:00: Marvelous Designer Workshop – a hands-on workshop on clothing making in Sansar using Marvelous Designer (MD), with members of the MD team. Thursday, March 8th, 17:00-17:30: Sansar Top 5 -Mars! – a livestream event with Sam and Boden Linden, who explore Sansar via VR. This week – living on Mars. Saturday, March 10th, 19:00-21:00: Red Bull Crashed Ice – watch the heart-pounding finale of this downhill ice skating championship and the Sansar Origin Cinema.